This simple Hamburger Baked Bean Casserole with Sriracha is a fantastic update to what was a staple in our home growing up. A bit of spice is nice! The last time I made a Hamburger Baked Bean Casserole I was right in the middle of the process of having decided to sell my old home and getting ready to actually put it on the market. While I will always have great memories of that home and I cried a river of tears at leaving it; it was time and I’ve been happy where I landed. Still, some things never change; it seems this casserole always comes about when I’m doing some pantry organization! Back in 2013 I was simply trying to use pantry items and not have to move them; this past week it was more about having too many cans of baked beans and not enough room to store them. That happens sometimes; I’ll see something and buy it and get home and find I already have plenty. Welcome to my world of baked bean, panko breadcrumbs, and dried espresso. Seriously I could open my own market with those three items! Every single time, this casserole transports me to those years of being a single mom and making casseroles and quick meals for two young girls. I honestly think versions of this recipe have been around for a gazillion years. If I’m not mistaken my mom made it for us as kids too; dishes like this were our idea of ‘Hamburger Helper.’ It’s funny; I’ve always loved this dish but never think of making it without a family to feed. I need to get over that; I love it too! It is requisite that it be served with either biscuits or corn muffins. And in keeping with tradition they are either Bisquick biscuits or Jiffy Cornbread Mix. NO judging!! I did mix it up just a bit this time from what I’ve normally done with the addition of some Rocky Mountain Sriracha. Who says you can’t go home again AND make changes? I’ve long been a proponent of Emeril Lagasse and his suggestion we ‘kick it up a notch.’ This sauce sure did just that. I was sent a bottle to sample and I was honestly not prepared for how wonderful it is. How wonderful? I opened my fridge and pitched the Rooster…it doesn’t even begin to compare. The flavors are so fresh and perfectly seasoned. Made with fresh Fresno peppers, organic agave nectar, organic sea salt, organic garlic and vinegar, it is bottled fresh right after mixing, rather than fermented. Flavorful? Absolutely. Hot? Yes. Burn your tongue hot? No. Meaning it was perfect for me…I want flavor, not a flame throwing experience! My neighbor Sam, something of a hot sauce aficionado agreed; this stuff is fantastic! Only available online right now but so worth it; SO good! 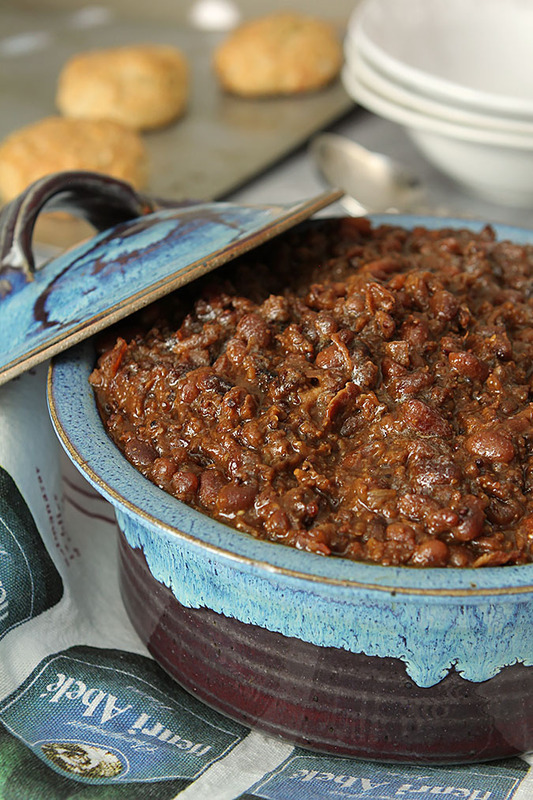 I can’t deny that the sweet element is what I’ve always found appealing; something about that mixture of molasses and brown sugar with a touch of mustard and a hint of smokiness that transports this dish far beyond mere baked beans; the addition of ground beef makes it a whole meal in a bowl. Adding heat? No words; makes it even better. Leftovers were a bit scarce so I added some pasta and topped it with some sour cream and more Sriracha Pepper Sauce. Second verse as good as the first! Really try this…bet your family loves it too! Combine the beef, bacon and onion in a large over proof skillet and brown until the meat is browned and the onions have softened. Drain off the grease. Add the remaining ingredients, mix well and bake in the oven for 35-40 minutes until hot and bubbly. 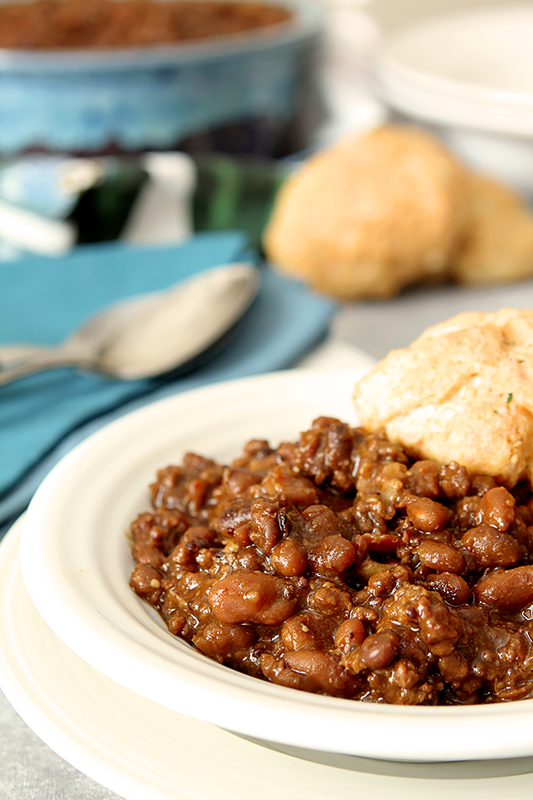 We love it served with biscuits or cornbread! In a hurry? Make it in a pressure cooker. Brown the beef, bacon and onions and drain. Add the remaining ingredients, set your pressure cooker on Manual/High for 5 minutes; let the pressure release naturally and serve! More? 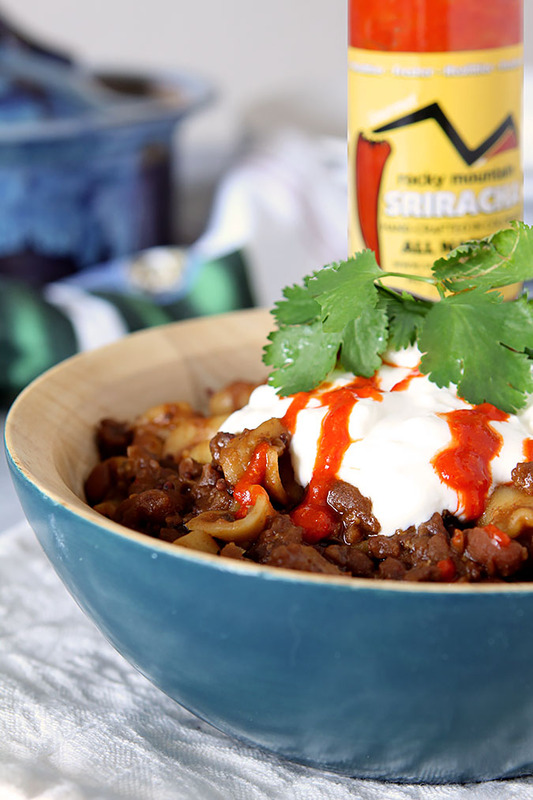 For leftovers, add the mixture to some cooked noodles and top with sour cream and more Sriracha Pepper Sauce. I was provided with a sample of the Rocky Mountain Sriracha but all opinions are my own. I like the looks of the sriracha on this! I make something kinda sorta similar sometimes — in fact I’ve had it on my “to blog” list for the last 3 years! Really should get around to making it . . . 🙂 Maybe I’ll just make yours instead! I am such a fan of beans, especially with brown sugar and bacon, Barb. This looks like the best bowl of warm comfort food with the addition of the ground beef and onions as well. Delicious! I guess to be fair, isn’t everything better with brown sugar and bacon Stacy? It is a great little casserole; tasty and filled with memories to boot. Perfect is right! I love how one item in your pantry could lead to such deliciousness and a wonderful trip down memory lane! So often my pantry is my inspiration Betsy; leaving home for ingredients is not something I ever want to do so I try to keep it well stocked which makes a dish like this so easy! Nope, nothing like this existed in South Africa when I was growing up… but I see definite possibilities for adding it to the “too lazy to cook much” weeknight dinner rota 😉 Love the cornbread to serve it with, packet-mix or not! This was often the no time to cook type meal; too often the case for a single mom with two kids. Homework, Girl Scouts, soccer practice. I often wonder how I did all that by myself; maybe why some of those years are a blur? Hi Barb! Ok, confession time… I’ve NEVER had this dish… but of course now I am intrigued and will have to try it ( I know, I know, I had a deprived childhood!) Looks like the perfect dish to have during La Crosse season! Wow, I don’t envy you with the moving process – the thought of having to do that sends shivers up my spine… but how liberating and freeing!! Will you be staying in the same area??? Details, details!!! Oh wow, this is indeed a nostalgic dish! And one I know my family will devour – I can’t wait to make it for them. Love these pantry meals. I have fond memories of the Jiffy box of corn muffins, too! That’s what my mom always baked. I wish you well as you prepare to move. I can imagine it’s an emotional, exhausting process, but hopefully it leads to a bright new chapter for you. Mmmm this looks so damn good, Barb, and just what we need for the weather! It is also my kind of home and homey cooking – start with something canned and super good and cook it up into a great casserole. Yum! And I am assuming that is cornbread? Oh perfect. I wish i had Bush’s baked beans here. Moving is always a change but I hope this move is a great one for you– your choice on where to live and to have your own space will be ideal. I’ll look forward to more pantry dishes like this one in the coming weeks. Best of luck with the move, I know how emotional it is. I just love that you are posting recipes using pantry items, so many times that dictates what is on the table for me. Love this because I just adore baked beans!! I love this old recipe! It just feels like a family meal, doesn’t it? And you’ll find no judgment here about using boxes and cans! The vast majority of people depend on a few conveniences even if they cook from scratch most of the time. I didn’t know you were planning a move. Sounds exciting, thrilling, and exhausting all at the same time. Wish I was closer…I’d be right over to help. It’s been on my mind and with news that Denver real estate values are high right now and there aren’t enough homes on the market, I decided to do it now when I might normally have waited until spring. I don’t live in a huge house but it’s pretty huge for one person. I’m pretty mobile but my leg will always be an issue so moving to a ranch will make life simpler I’m sure; not to mention the idea of having far less to clean has a certain appeal! No judgment here Barb. I keep all of those items in my pantry too because they’re just plain good! This looks delicious!!! Best wishes on the move! I’m sure it’s difficult leaving your old place but think of the excitement and new memories you’ll build in the new place. Plus, a new kitchen to cook in!!!! Thanks Renee; no doubt right now all I can feel is loss; I’m sure when I have less to clean and less steps and NO mortgage, the benefits will kick in. Right now it’s just a feeling of both loss and total exhaustion at the effort it’s taking to organize, pack, store, pitch and sell a whole lot of stuff! I know that turning your life upside down is difficult at best but I can’t help but feel that this is going to be a wonderful much needed adventure for you. I hope that your next home is your favorite yet. The next chapter in you life is all yours to write. I make a kinda, sorta similar recipe and boy do people love it. This looks like a delicious quick meal. I hope you got to share this with your daughters during one of your breaks from packing.